Bully Poster Contest: Cutler-Orosi, CA | WeTip, Inc.
Cutler-Orosi USD Bully Poster Contest a Success!! Last week Karina found out her recent artwork was chosen for a national poster as part of the WeTip anonymous bullying hotline. Her artwork will be on posters in sch ool districts across the nation and at WeTip's national conference in Los Angeles on April 22. At first the contest was just a local event. The 16-year-old and two other students at Orosi High, Janette Madrigal and Jorge Macedo, were nominated for their artwork. Probation officer Javier Gomez, in charge of the contest, shared the students' work with a WeTip representative. Arenivaz's artwork was chosen to be displayed at the national conference. All three students' artwork will be available for schools to purchase. The students' work will also be put on posters locally and distributed throughout the Cutler-Orosi Joint Unified School District. 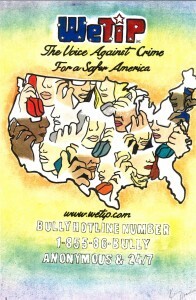 "The posters will be part of an anti-bullying campaign for the school district," Gomez said.